We had a blast! Check it out. I realized that there was not an actual available, online, readable, openly accessible version of Saturnistas also known as Her Saturn Returns – The Play! online. Click the image below. Here it is! Enjoy! Learn more about Her Saturn Returns The Play here. The last time I wrote about a cooked bird was in March when my grandmother’s altar was her stove. And now, I’m stuffing myself with more of it as I contemplate the exciting reality that I’m writing a play! Can it be believed that I am actually writing a play? Well, okay, the play is already written, and some of it will be “read” on Saturday, December 14th in the little black box theater in the lower east side that I’ve known to call home. It’s relevant here because the play is called: Her Saturn Returns – The Play and it is about not only my journey turning 30, but my journey documenting the tumultuous times of the lives of the queer women of color that I’ve met throughout the past four years while undertaking this project. It’s very exciting and more updates to come. What does one wear to their first staged reading? 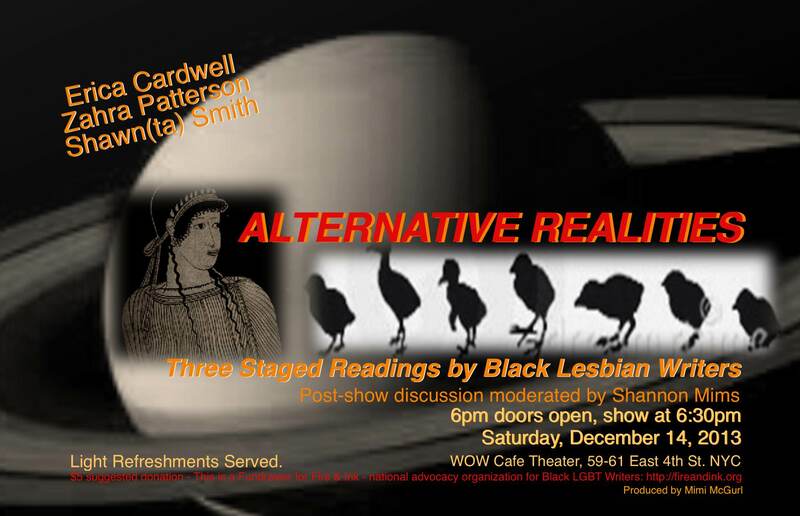 Fortunately, I’ll be sharing the stage with Zahra Patterson and Erica Cardwell, two black lesbian friends and writers (both of whom are happenstantially some how connected to the Her Saturn Returns project), and will be having staged readings all of their own. We will read one Act each from each of our pieces. We’re still seeking actors, and so, if you are a queer woman of color (or not, but just an awesome actor), then let me know, and perhaps you can read for a role or two or three.